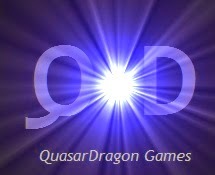 Something a bit different for QD, a review and an informal editorial. Not to worry though, anyone not interested will find free fiction links in the post directly below this one and more links above it later today (21 Feb. 2011). Pros: Price, USB, Light weight. Cons: Smaller Screen, Sluggish when first starting a new book. This is my first ebook reader, which might have some influence on my opinion of it. However, after just a couple of months with it, the idea of being without an ereader is as unthinkable as going without a computer, more so than going without a cell phone. Screen: The screen is a bit smaller than most ebook readers, though that makes little, if any, difference on most books, though on magazines or graphic novels it might hurt. It is very easy on the eyes. Reading a novel on this is virtually the same experience as reading a paperback, though it's much easier to carry a hundred or so ebooks than the same number of paperbacks. However, heavily illustrated magazines and graphic novels don't fare well on the Libre with the squished PDF images often being nearly unreadable. Manga, typically with larger images and writing, are nearly acceptable to read on the Libre. Glare: Glare is mild issue inside with a few angles, depending on your light source, being difficult at best. However, just a slight change, about five degrees or less, in how I hold the Libre is always enough to completely fix the problem. I took my Libre outside in the bright sunlight yesterday and was pleasantly surprised to find that it was even easier to read than inside. Connection: The Libre connects to a computer with a standard USB cable, I use the same one to connect my MP3 player and PSP to the computer, and requires no software to use. It is a simple matter to drag an ebook from your computer to the reader. It is a different matter when it comes to DRM items, but since I will never download anything with DRM, I can't say anything about it. The Libre has no wireless connect ability, but after the kindle 1984 debacle, this is arguably a good thing. Extras: The Libre comes with an mp3 player, mostly for audiobooks, and a picture viewer. I really can't say much about these as I haven't used either. For me, these are of extremely limited use. When I want to listen to an audiobook on the go, an MP3 player is much more convenient and there are many better ways to view a digital pictures than in B&W on a cheap ebook reader. 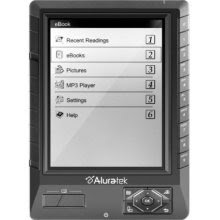 Conclusion: The Aluratek Libre eBook Reader Pro is a good bargain-basement reader with few frills, but still providing a good experience for its core function, reading ebooks. Better readers may already exist, and will likely exist in the future but the Libre is definitely a good enough reader for now. Being a true bibliophile, I love the physical presence of books. They provide a reassuring comfort that can never be replaced digitally. However, it is impossible to deny that ebooks are the future. While physical books are likely to remain around for many, many years, they will occupy an ever shrinking piece of the market. With that in mind, I'll look at what I consider the good and bad aspects of ebooks, as well as my hopes for them. Public domain actually means something. With physical books a public domain book like The Time Machine costs roughly the same as copyrighted book the same size. There were few benefits for the consumer. Now, more and more public domain works are freely available online. Ebooks take up much less space and are far more portable. As any bibliophile knows, books take up space, a lot of space and are very heavy. Ebooks eliminate space concerns, a 1TB hard drive can easily hold more books than a public library. Carrying a one pound Kindle would save the backs of countless college students whose backpacks are full of heavy textbooks. They are much faster. If an ebook is for sale, or better yet free, you can easily be reading it within five minutes of starting to look for it. With a physical book, you either have to drive to a book store, which might have to order it or order it online and wait for it to arrive in the mail. Piracy is a problem. While piracy might someday be used to the benefit of writers and publishers, it is currently a growing problem. There are no easy answers here. Perhaps embedded advertisements might work. I don't know. Browsing is far more difficult. Amazon and other online booksellers do there best, but there is no equivalent to walking through a book store to find just the right book. Pricing is another difficulty. It seems as if publishers and book sellers are still trying to kill ebooks by overpricing them. For example, at the time I'm writing this Amazon has the Kindle edition of Deus Ex: Icarus Effect priced at $9.99, while the trade paperback is priced at $8.91. There are countless other examples of overpriced ebooks. While there are certainly costs involved with an ebook, it insults the intelligence of the consumer to suggest that it is equivalent to the cost of even a mass market paperback with the cost of paper, printing, transportation, sample copies, and returns. For many years publishers have blamed rising book prices on returns from booksellers, yet suddenly with the dawning of ebooks returns and the other listed costs are said to unimportant in pricing. The problem is that there is an attempt to give ebooks a status that is somewhere between a trade paperback and a hardback book. In reality, an ebook is, and will always be, somewhat below a mass market paperback in value. No ebook should cost more than 2/3 the price of an equal sized (in words) mass market paperback. (Of course exceptions exist for small publishers whose products were always significantly higher than large publishers.) I really don't think there is a villain in the over pricing of ebooks, merely a misunderstanding of their status as well as an understandable fear of change. DRM is an understandable response to piracy, but a bad one. First it paints a target on the work for many hackers. Cracking copyright protection has never been especially difficult and is unlikely to become so. Second, and much more importantly, it cheats consumers who actually pay for the product. When you purchase a physical book, it is yours as long as you take care of it. If you purchase a DRM protected product of any time, you are effectively only renting it. Unlike books, electronic devices don't typically last for a lifetime of use and any product locked into that device dies when the device does. The online storage used by some companies may seem a safer and better method, assuming you don't mind your personal tastes being analyzed and sold or hacked into by unscrupulous individuals. However, these DRM materials are equally fragile. Unlike physical books, most companies don't last a lifetime either. What will happen to the online DRM materials when, not if, some of these companies go out of business is yet to be seen. Some may be transfered to other companies but much will simply cease to exist faster than a 1984 on a Kindle. I am optimistic that ebooks will reduce, though not eliminate, the size fetishism that seems to have infested the genre markets. There are far too many gazillion page epics on the market and far too few physical books that fall into 120-200 page range of most classic novels. Without side by side comparisons books are more likely to be judged on their merits. And while there are likely to still be some behemoths, as there should be, there is likely to be more of a market for smaller novels and hopefully even novellas. I hope ebook and ebook reader prices will come down enough to not only encourage people to buy them, but to buy them in great quantities. In particular, I hope a business model arrives that allows authors and publishers to make much more money, allows far more full time "mid-list" authors to make a living, and makes ebook much cheaper for the consumer.